Due to a last-minute cancellation, motor yacht AXIOMA is now available for a year-end reservation over the New Year’s Eve holidays and is offering a deeply reduced rate to secure a new booking. Normally priced at Euro €550,000 per week for holiday dates, the owner has reduced the price to €490,000 per week – a savings of €60,000 (about 11%). Winner of the 2014 World Superyacht Award for Design Excellence, the 72 meter (236 foot) superyacht will be cruising the Windward islands of the Caribbean in December (St. Vincent and the Grenadines). She is currently booked 17 – 26 December, beginning in St Maarten and concluding in St Lucia. One of the world’s largest rent a yacht vessels in the market, motor yacht AXIOMA offers charter guests enormous volume. With six decks, the builders at Dunya Yachts have created a superyacht with over 30,000 square meters of space. Great crew to guest ratio – 1.6:1 (professional crew of 20)! Perfect for 5-6 couples, motoryacht AXIOMA accommodates 12 guests in a master suite, VIP suite, and four double guest cabins (two of which are convertible into twins). The stunning beach house-style interior by the legendary late Alberto Pinto contrasts natural woods and luxurious flourishes. On the main deck, the infinity swimming pool is an outstanding exterior feature, while the open mezzanine in the main salon creates a real ‘wow effect‘ with its double-height and space. A large round table on the owner’s aft deck offers an amazing all’aperto dining option. The media lounge on the owner’s deck is a friendly socializing area with plenty of interesting books and a large screen television. The bridge aft deck boasts a large Jacuzzi with a swim-in bar, which is surrounded by large sun pads. Also located on the bridge deck are a fully equipped gym, massage room, and a steam room for wellness. The sun deck features lounging and intimate seating and sunbathing areas with a shower and day bathroom, and a BBQ. The yacht also swags a 3D cinema for 8 persons situated on the lower deck. Reserving your yacht charter with 1-800 Yacht Charters makes a difference to the world and to the environment, as a portion of commissions from EVERY charter goes to charity, in the charterer’s name. We also offer 6 star customer service and a BEST PRICE GUARANTEE. We are at your service! Planning on walking the red carpet at the 2016 Cannes Film Festival, or sitting front row at the 2016 Monaco Grand Prix? If you are, the owner of one of the world’s largest yachts for hire has put forth an enticing offer for participating and spectating at these fabled Côte d’Azur special events. The 72 meter super yacht AXIOMA has announced a 15% discount for any static, special event yacht charter booked by the end of 2015. That equates to a savings of €73,500 off the winter weekly rate of €490,000. When it comes to corporate hospitality, a Cannes Film Festival yacht charter is the ideal venue for both social gatherings, and conducting business. Being docked within feet of the entrance to the Palais des Festivals et des Congrès, the primary building where films are screened and studio execs meet with prospective buyers. Many attendees choose yachts to hold private business meetings in a more intimate setting. In the evenings, the yachts are often the site of sponsored product-placement cocktail parties. 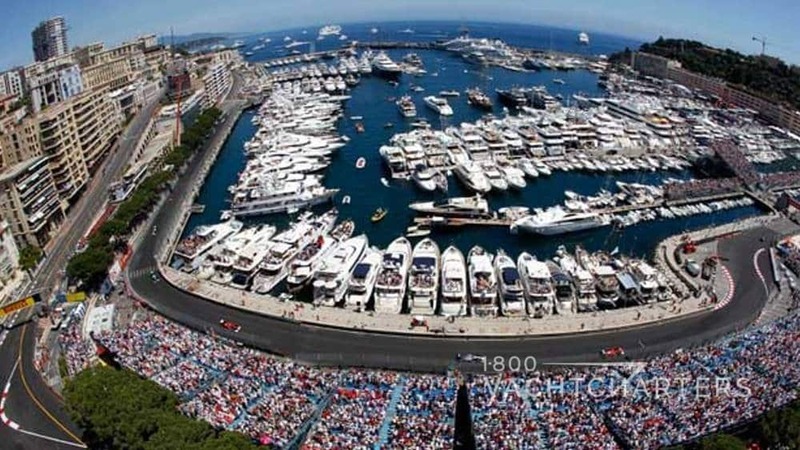 Just a few miles down the road, the principality of Monaco holds the annual Formula 1 race through the streets of Monte Carlo, and along the quay (docks) of the Port Hercules marina. A spectacular venue for watching one of the world’s most famous auto races, guests onboard yachts are just feet away from the action on the course. Built in 2013 by Dunya Yachts, with interior design by Albert Pino, the 236ft motor yacht AXIOMA offers charter guests enormous volume for hosting corporate events. The yacht boast six decks and more than 30,000 square meters of space. Amenities include a private outdoor cinema and lounge area, infinity swimming pool, and helipad. In 2014, the yacht received a World Superyacht Award for design excellence. For a sampling of yachts available for corporate hospitality charters, call 1-800 Yacht Charters at 1-800 YACHTCHARTERS (that’s 922-4824) or +1-305-253-7245, email us, or submit our convenient online form, and we’ll be in touch with you right away to plan your yacht charter special event. One of the largest yachts available for hire has cut her Caribbean premium-season rate for Christmas week by €60,000. The 72.5 meter Dunya Yachts motor yacht AXIOMA is currently open for Christmas week, preferably in the Windward islands of the Caribbean. To entice a reservation, the owner has lowered the rate from €550,000 per week to €490,000 per week – a savings of more than 10%. Currently ranked #151 on the list of the world’s largest yachts, super yacht AXIOMA (ex yacht Red Square) accommodates 12 guests in a master suite, VIP suite, and four guest double cabins, two of which are convertible into twins. The yacht boasts a beach house-style interior by the legendary designer Alberto Pinto (who sadly passed away before the yacht was launched in 2013). The interior “wow factor” is off the chain with unique features like an open mezzanine in the main salon, and a media lounge on the owner’s deck. Exterior amenities are just as amazing, especially the infinity swimming pool, and the large Jacuzzi with a swim-up bar, located on the bridge deck. This stunning superyacht is already reserved 27 Dec, 2016 – 3 Jan, 2017, from St Lucia to Canuan; thus, the owner would like to secure a charter immediately prior to this booking somewhere in the area of St Lucia. The finalists for the 2014 ShowBoats Design Awards have been announced, and one of the world’s largest yachts, the 72 meter motor yacht AXIOMA, has been nominated for two awards. Best Interior Design – Displacement Motor Yachts, 60 meters and larger. Best Exterior Design and Styling – Displacement Motor Yachts, 60 meters and larger. Built by Dunya Yachts in 2013, and designed by Alberto Pinto, the St. Martin yacht charter vessel AXIOMA affords charter guests enormous volume. Featuring six decks, the builders have created a superyacht with over 30,000 square meters of space. This magnificent yacht is available this winter at a rate of EURO 490,000 per week plus running expenses. The ShowBoats Design Awards are now in their 5th season, and shine the spotlight on the yachting industry’s most talented designers and builders. The international list of nominees – superyacht owners, designers, and industry leaders will gather for a gala event on Monday, February 24, at Swarovski Crystal Worlds in Wattens, Austria. The awards ceremony will take place on the first evening of the Superyacht Design Symposium – a two-day affair for superyacht owners and industry professionals. 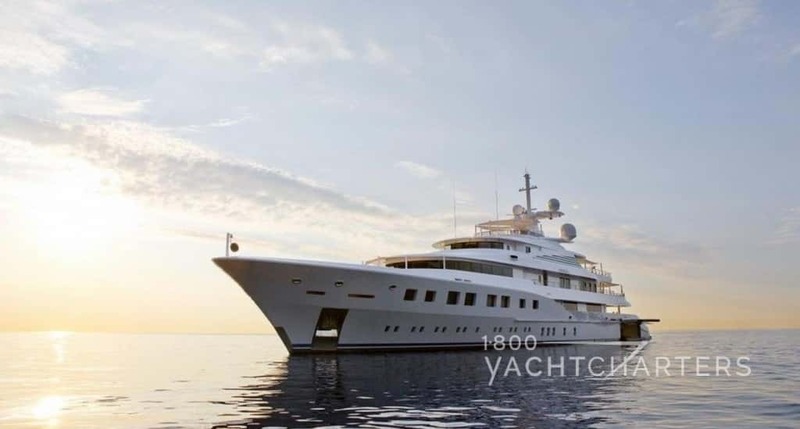 Other yachts that might be of interest in terms of similar size and capacity include 2011 Fincantieri motor yacht SERENE, 2011 Feadship motor yacht AIR, and SYCARA V.
For further information, please contact 1-800 Yacht Charters at https://www.1800yachtcharters.com/book-now-contact-us/.